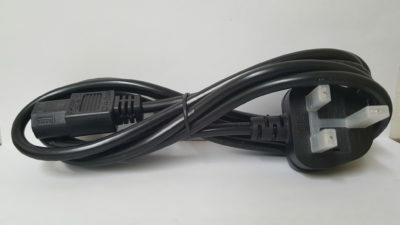 EL210 (BS1363 with 13A Fuse) + EL701 (IEC60320/C13), H05VV-F, 3C x 1.00 mm sq., 10A, 250V, 70°C, 2.5 meters long (8.2 ft), Black, Hank & Tie. RoHS Compliant. British BSI Approval/Singapore PSB approved. EL210 (BS1363 with 13A Fuse) + EL701 (IEC60320/C13). H05VV-F, 3C x 1.00 mm sq., 10A, 250V, 70°C, 2.5 meters long (8.2 ft), Black, Hank & Tie. RoHS Compliant. British BSI Approval/Singapore PSB approved.